During the past two years I've enjoyed a procession of some of the world's great loudspeakers through my new listening room. It started with the Vandersteen Model 7, followed by the $95k Rockport Altair, $200k Sonusfaber "The Sonusfaber," $78k TAD Reference One, and $95k Focal Stella Utopia EM, to name a few. So when logistics required that I return the $139,500 Venture Ultimate Reference three weeks before the arrival of the $108k Lansche No.7, I found myself without a reference-class loudspeaker. My solution was to move a pair of PSB Synchrony Two's from the theater room to the listening room. Synchrony is PSB's upper-end line, with the Two the next-to-top model. A tall, thin floorstander featuring three 5.25" drivers and a 1" titanium-dome tweeter in a ported enclosure, the Two is priced at $3500 per pair, or about one-thirtieth the cost of the speakers I'd become accustomed to hearing. It is, incidentally, quite similar in design, appearance, price, and configuration to the Imagine T2 reviewed by Robert E. Greene in this issue. I knew the Synchrony Two was a great speaker and a tremendous value after hearing it in my theater room, but driving it with world-class sources and electronics in a good acoustic environment revealed just what a great bargain it is. I'll echo Robert E. Greene's detailed observations of the T2 in his review this issue; I heard the same qualities from the Synchrony Two. This loudspeaker has a very smooth and uncolored overall tonal balance, no narrow-band frequency-response anomalies, wide dynamics, good bass extension, and superb soundstaging. But were the limitations inherent in a design of one-thirtieth the price of my usual loudspeakers apparent? Obviously. The Synchrony Two is no Focal Stella Utopia. But I found that after just a day or so the sonic shortcomings relative to world-class loudspeakers receded into the distance and the sense of music-making came to the fore. After a period of hearing what the Synchrony Two didn't do relative to the mega-loudspeakers, somehow that part of my brain turned off and I became fully engaged musically. This is not just a testament to the quality and value of the PSB Synchrony Two, but also reflects the flip side of a phenomenon called "hedonic adaptation." This term describes how, as one becomes accustomed to a higher level of quality (of living standard and every other experience), one adapts to that level and it becomes the new baseline. For example, I frequently am thrilled by installing a great new component in my system, and spend a few weeks listening to all my favorite music day after day. But then one day I realize that the quality level that was so thrilling just weeks before has become the norm. I still enjoy the music, of course, but the experience lacks the exhilaration of newfound discovery. Hedonic adaptation is a driving force behind the high-end audio industry. Listeners look for that next replacement component that will return them to a state of bliss. This phenomenon is, in a way, unfortunate because it can put listeners on the constant-upgrade treadmill. As one industry insider wryly observed to me, "Ours is an industry built on dissatisfaction." But hedonic adaptation works both ways. As the quality level is decreased, the lower level becomes the standard, the baseline, for judging the experience. This phenomenon, which describes any sort of pleasure, is greatly amplified when it comes to music listening and audio quality. That's because music's appeal is so powerful that the fidelity of its reproduction takes a backseat. This is why I get so much musical pleasure from my iPods, which I listen to every day while working out on an elliptical machine or at the front of my car stereo. I've sometimes wondered what I would do if, after spending more than 23 years critiquing the world's finest audio systems, I no longer worked in the industry and had to spend the rest of my life listening to a modest audio system. Would I no longer be able to enjoy music with the same pleasure I have experienced with state-of-the-art equipment? Would I be ruined for life? 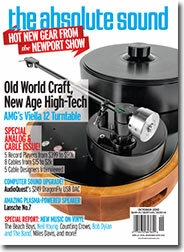 Do those of you with moderately priced systems enjoy music any less than those who own mega-systems? The answer is an emphatic "no." Hedonic adaptation, coupled with music's potent ability to transport us across time and space no matter what the sound quality, can also work in our favor. The pendulum swings both ways.